"While a lot has been written about George's life, going as far back as his childhood. The same cannot be said that of Eddie Mannix and Toni Lanier. Many wonder why Mr. Mannix accepted his wife's affair with another man? This would seem hypocritical to those considered devout Catholics." I hope to some degree I can shed a little insight into the building blocks of this subject and as a result you'll recognize the originality of these findings. On Wednesday, November 22, 2006 I received a Thanksgiving - well wish call from Mr. Jack Larson . As a result we went into a series of various discussions. One subject was being curious to know more of when and how Eddie met Toni, as well as the beginning of Toni and George's relationship. Jack went on to explain that in 1936 during a break in filming the The Great Ziegfeld Toni was propped upright on a slanted board to keep the tightly fit dress from tearing at the seams. Toni Lanier, for some reason, got upset and irate at the director who was giving her a hard time. Toni was not one to be pushed around. After all she was the real deal, a Ziegfeld Follies dancer who would have none of this. She stormed off the set, and the last anyone knew she set out for Hawaii. Soon Eddie Mannix was dispatched to bring her back (what a cool assignment). Mr. Mannix finally reached his destination ready to tell Toni she is behaving like a "bad girl and time is being wasted." But Toni was not to be pushed around by anyone. And she gave Eddie a piece of her mind about the director. Eddie was immediately smitten and in love with the feisty dancer. He'd seemed to have met his match. They would enjoy each other's intimate company for the remaining time in Hawaii. Jack also was very certain George and Toni met sometime around 1949 in New York during George's live television work. Jack also was doing live television during this time but their paths never crossed. In addition, I asked Jack if George ever went to Europe. He said he believed he did until a close friend of George's corrected him that George never went to Europe. A couple of days went by and I received an e-mail from Serena Enger. Serena presented to me questions regarding George, Toni and Eddie Mannix. Already having discussed this with Jack I responded. 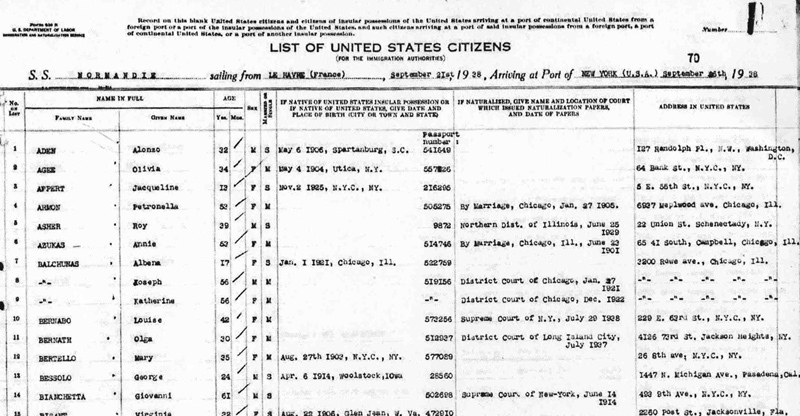 Serena answered with various pieces of information about the times, which included documentation of ship passenger and crew lists and other family background info via US Census reports. The copies were not very clear and Serena offered to send clear copies by mail. After reviewing these documents I recognized immediately the originality of this information with respect to the overall history of George Reeves. I strongly suspect what you are about to read will be for the very first time. In addition to the information Serena provided to support Jack's story of Toni being in Hawaii, it also contained her family information. Serena, not knowing I had this discussion with Jack, also sent me information that confirms George did travel to Europe. When I sent this information to Jack, he was happy to know he was right about George's Europe travels and a little bit startled by Toni's family background as you will read for yourself below. Below is an excerpt of the May 16-23, 1936 Lurline ship Passenger & Crew list from Honolulu, Hawaii to Los Angeles Harbor with Toni's listed as Camille Lanier. Serena would provide the following newspaper inside headlines and excerpts. Another of the films to be done in the grand manner was launched this week when Metro's most elaborate musical : "The Great Ziegfeld," scheduled to cost $1,500,000. Further into the article: Thus far but two former Ziegfeld girls have been signed, Vanita Vardon of "Rio Rita" and Tony (sic) Lanier, publicized by the producer as "Camille." Stricken while dancing at a local night club, Toni Lanier, film actress known as the girl with the $1,000,000 legs, was rushed to the Cedars of Lebanon Hospital early yesterday for an emergency appendicitis operation. 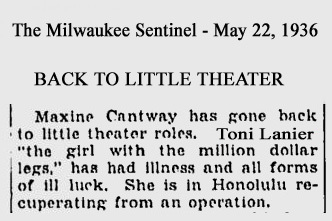 April 2, 1936: Toni has an emergency operation. April 15, 1936: Premier of The Great Ziegfeld. 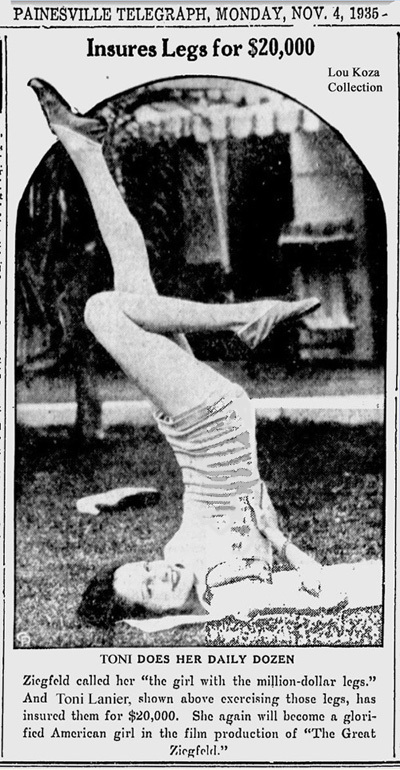 May 22, 1936: Toni recuperating in Hawaii. Because filming started in October 1935, could the Eddie Mannix - Toni Lanier romance have actually happened during another, earlier trip to Hawaii? This would mark the duration of their relationship longer while Eddie was married to Bernice. Based on the in-bound manifest and articles above the evidence is Toni went to Hawaii after the filming The Great Ziegfeld was completed. Jack refers to Toni going to Hawaii during the filming. If Jack's memory is correct, which is Toni, followed by Eddie went to Hawaii during the filming of The Great Ziegfeld, then the only logical explanation is we simply haven't found the documents. It is safe to say Toni went to Hawaii on several occassions. 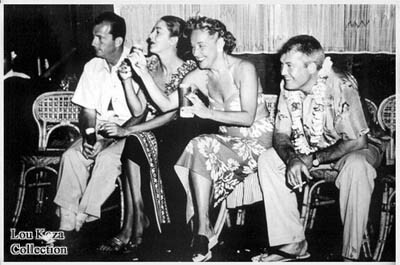 Below is an image of Toni and George in Hawaii during his filming of From Here to Eternity. In one of my conversations with Jack I sat in my car after work talking to him on my cell phone. When involved in a telephone conversation, because of the many subjects covered I will jot down notes, since I'm not of the habit of audio recording conversations. So what follows is not word for word Jack's, but similar to what he continued to tell me: It is not known exactly how long after Toni returned to California but eventually she moved in with Eddie. Eddie in 1936 was married to Bernice... that is, until the car she was a passenger in overturned in the desert 4 miles south of Palm Springs. Based on Eddie's rough-tough demeanor and background, ridiculous rumors circulated that Eddie had something to do with Bernice's death. Rumors it remained. 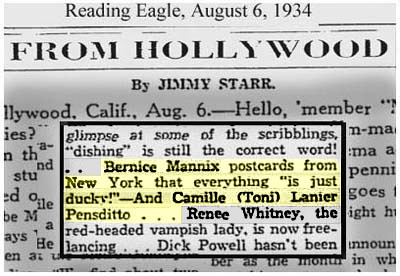 Bernice Mannix died on November 20, 1937. They were married for 18 years. It has been told that Toni moved in with Eddie a very short time after Bernice's tragic death. It is not known when Toni Lanier began actually calling herself "Mrs. Edgar J. Mannix." Most likely sometime in the late 40's. The LA Times dated, Mar 24, 1950 referred to Toni as "(Mrs. Eddie) Mannix." Rumors told the two might be getting married when on October 26, 1938 it was reported Eddie was searching for a new home and again on August 1, 1944 when it was reported the couple were planning a trip to Mexico. But, just when you think you have a handle on it all, along comes this bit of news oddity for those of us who never would have thought the future Mrs. Mannix and the original Mrs. Mannix had ever crossed paths. So now we are to logically consider that Toni and Eddie knew each other before Jack's story of Eddie being dispatched to Hawaii to retrieve Toni during the The Great Ziegfeld. Are you confused? A photo of Toni sitting with Walter Pidgeon in PHOTOPLAY Movie Mirror - May 1943 has her identified as "Toni Lanier." Throughout the 40's Eddie had many girlfriends as was fairly common with studio executives of the time. Toni therefore engaged in her own spicy relationships. It would become as George described to Jack their long standing "arrangement." After all, the two were not actually married. 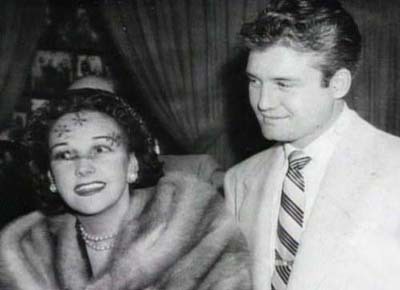 By the time Toni met George, he and Ellanora had separated in 1949 and offically divorced by 1950. 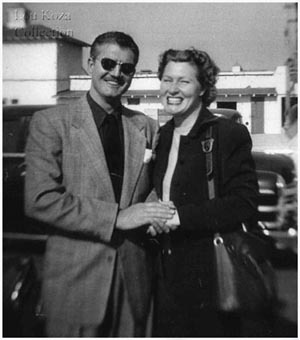 Jan Alan Henderson has proclaimed on a number of occasions to me that once Toni and Eddie decided to be legally married in May 1951, Toni stated to Eddie that George would be coming with the deal. Jack felt this is certainly possible. By conventional standards an "arrangement" in most typical marriages is unheard of. But this is Hollywood and for whatever reasons things are done slightly different in this part of the country. Spencer Tracy while married had a loving relationship with Katherine Hepburn. It too was an open secret. Perhaps it was more the devout Catholic factor, but one reason Mr. Tracy and his wife were not divorced was because she enjoyed the social life of Hollywood and would not want to have her status compromised. I suspect Toni had similar reasons. Certainly the name "Mrs. Mannix" got her into many doors and social circles. Toni's personal reason for not leaving Eddie was the he would soon pass away from his illness, so why jeopardize losing the Mannix fortune. The estate being the reason the two married in May 1951, fearing a sudden death of Eddie would leave Toni with no legal grounds for finanicial security. George would prove money wasn't most important when he terminated the relationship with Toni in Sept. 1958. Various documents Serena sent show that Toni's year of birth which, when compared, show different years and days of birth in the month of February. Imdb.com lists her birth date as September 19, 1906. The Fourteenth Census of the United States - 1920, City of Rochester you see below gives her estimated year of birth as 1907, which is a estimate from the Census Department. " Numerous passenger list documents, which we assume were based on her passport, list her birthdate as February 22, 1911, (and 1916) as does the California Death Index. It is clear Toni had reasons of her own, perhaps professionally to adjust her birth date accordingly. But what reasons would there be to not make it known she had a sister? Jack explained one day he received a call form Florice Talley to inform him Toni was in the hospital. He was at the time quite discouraged from all the events that had happened throughout the years and felt uneasy about the call. He'd never known Toni had a sister. He learned Florice lived near the Los Angeles Farmers Market. I sent Jack a photo (see right) of George and Florice posing in their Sunday best outside this location. Jack said that this photo was most likely taken by Toni and it would stand to reason it was taken at the Los Angeles Farmers Market because Florice lived close by. He also remembers Florice and her husband having moved into the Mannix home at 1120 El Retiro Way not long after Toni passed away. In another surprise and turn of events is a 1920 Census document from which Serena provides. It lists a total of 10 siblings, a father and mother going by the last name of Froomess. Jack was completely unaware of the number of siblings Toni had, no knowledge of her true birth name and the fact her father was born a Russian Jew (in 1871) from French parents and her mother was born in France (in 1881) from Canadian parents. Jack was unaware that Toni had a Jewish ancestry and found a slight humor in the fact she considered herself a devout Catholic. The reasonable answer to this is Toni was raised by a Catholic mother. However nothing in the documents suggest Elizabeth was Catholic. But it is probable she was. Elizabeth was born in 1881 France and according to the Census it lists her parents as Canadian. All this came to Jack in a startling discovery because he'd always believed Toni was from Irish descent. It is true Eddie came from an Irish background. Below is the 1920 Census for your review. 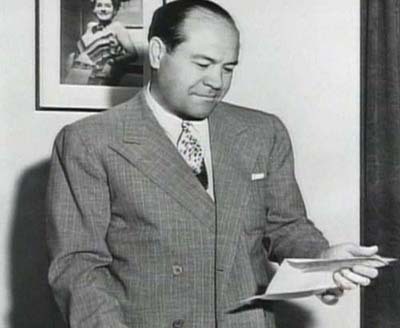 Another sibling, Tonis eldest brother, Emanuel (who became Eddie Forman), moved to Hollywood in the early 1930s and became a writer for the radio program, Stage Door Canteen, as well as a writer for comic and boxing-related short features, and for Abbott and Costellos television program. I found that Toni Mannix may have given inaccurate information about her birth date to authorities. Mrs. Mannix's Social Security Death Index information list her birth date as February 22, 1911. The California Death Index lists her birth date as February 19, 1906, which is consistent with the 1920 Census data.. The California Passenger and Crew Lists 1893-1957 for a May 16-23, 1936 lists her a Camille Lanier, " age 24 (born about 1912). A California passenger list dated July 1948 list Eddie and Toni returning from a trip to Hawaii. Toni lists her age as 32, which boost her up to 1916. Actor Jack Harris, a friend of George's from the Playhouse years was also present on this voyage. For those who may not recall or know, Mr. Harris is interviewed in the George Reeves segment of A&E Biography. The U.S. Census lists the Froomess family in the 1920 Census in Rochester, New York. "Camille" is listed as about age 13, which would place her at the 1906 date. Florice, her sister is listed as age 12. The Social Security Death Index lists "Florice Talley" as having been born in 1907. And so, Toni Mannix, the woman we've known as Camille Lanier, is actually Camille Froomess. She is French Catholic decent with a quarter trace of Jewish, not Irish 100% Catholic. She had ten siblings, not just Florice. Jack would suggest the name Lanier must have come about as her Ziegfeld Follies stage name. 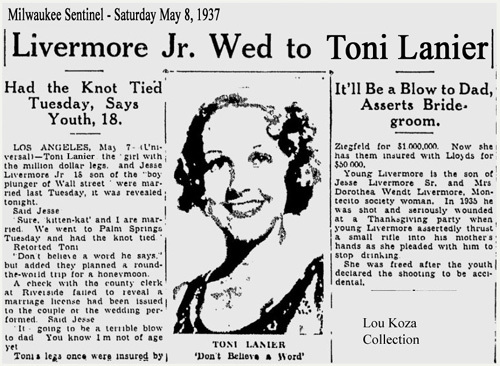 Another bit of surprising news told in the Milwaukee Sentinel, dated Saturday, May 8, 1937 is that Toni married Jesse Livermore Jr. earlier in the week on Tuesday, May 4 (see below). A busy girl, the same year she dated David Mdivani on June 3, Bill Davis on July 28. On February 5, 1938 she dated actor James Craig and house-hunting with Eddie Mannix on October 26, 1938. Edgar J. Mannix: Born: February 25, 1891. Died: August 30, 1963. Place of birth: Fort Lee, New Jersey. Father: John Mannix from Ireland. Mother: Lizabeth Streike from England, born to German parents. In June 1959, Eddie was 68 years old. Toni Mannix: Name at birth: Camille Antoinette Froomess. Born: February 19, 1906. Died: September 2, 1983. Place of birth: Rochester New York. Father: Charles Froomess from France. Mother: Elizabeth from Canada. In June 1959, Toni was 53 years old. George Reeves: Name at birth: George Brewer. Adopted name: George Bessolo. Born January 5, 1914. Died: June 16, 1959. Father: Don Brewer. 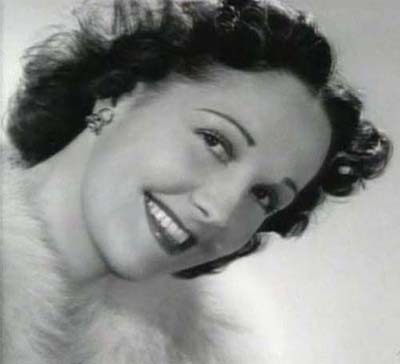 Mother: Helen Lescher. Step-father: Frank J. Bessolo. In June 1959, George was 45 years old. Interesting to note is George passed away on Gilmor Brown's birthday. Mr. Brown was born on June 16, 1890. Speaking of Gilmor Brown, remember above the discussions of George not ever traveling to Europe? The documents present below show otherwise. Below you will find two passenger and crew ship lists, one dated September 23, 1937, the other September 21, 1938. Included on the list is Gilmor Brown, the renowned director of the Pasadena Community Playhouse. Discussing this with Jack, he believes George traveled as Mr. Brown's traveling secretary. Gilmor was scouting plays in France to bring to the Pasadena Community Playhouse. Up to 1948 it would seem Mr. Brown visited Europe once a year. Serena would make note that it might seem risky traveling to France during this turbulent time in world history. Other passenger lists provided by Serena would include Murray Yeats (1931 & 1935) Jack Harris (1947) and Charles Davis (1950 & 1951). All traveling with Mr. Brown. You will notice George Bessolo's birth date is listed April 6, 1914. By 1937, George was aware of his true birthdate January 5, 1914 and his real last name being Brewer. Most likely, his official date of birth documents were still inaccurate and traveled accordingly. According to Jan Alan Henderson's Speeding Bullet: The Life and Bizarre Death of George Reeves, The Second Edition it states that "Frank adopted George at age 13 (1927)." It is unknown if George referred to himself as Lescher or Brewer up to the point of being adopted by Frank Bessolo. It would seem he would be aware by age 13 something was not in sync. George was tested for GWTW on Monday, January 23, 1939 and signed to a 10-week contract (as George Bessolo) on Wednesday, January 25. He started shooting the next morning, Thursday, January 26, the very first day of principal photography on the film! Thats the scene Harrison Carroll wrote about (he doesnt mention in his February 6 column that the filming started 11 days before his column was published!). .) No memo exists that I can find regarding the actual change by Warners of his professional name to George Reeves, but it had to have occurred by Monday, June 26, 1939, because the next Warner memo to mention him notes that his name has already been changed to Reeves. As it was Warners that came up with the name, and George had no relationship with Warners until May, 1939. As one chapter ends, another one begins. By 1938, George Bessolo would begin filming his first major motion picture, Gone with the Wind released in 1939. From this moment on he would be known as George Reeves. Toni Lanier and Eddie Mannix would begin their life together. All three unaware of a future fate that would eventually bind them together forever. Midway across America in the city of Cleveland, Ohio, two very shy young teenagers named Jerry Siegel and Joe Shuster would after years of fustration finally attract a publisher for a new sensational creation they boldly called.....SUPERMAN. A name George Reeves would become synonymous with for years to come. I want to especially thank Serena Enger who just happened on by at the right time to send me an e-mail with some very interesting information. She is very resourceful and astute to Hollywood history. For me it was interesting to be the dovetailing focal point of Jack's stories and the supporting information provided by Serena. And of course, a huge THANK YOU to the one and only Mr. Jack Larson for his valuable time to discuss these topics. I hope you found this information interesting as The Adventures Continue. The feature above titled Relative Revelations is the copyright and ownership of Lou Koza and cannot be reproduced by any means, in whole or in part without Mr. Koza's written permission.